I enjoyed this book, but my abiding memory is the Insane Asylum where in spite of humane treatment, everyone begged the guardians that they be released. I can see where care in the community came from. It makes me glad that things have changed! It sounds as though this one really is beautifully set in place and time, Margaret. And I do like historical novels that make you feel as though you’re really there. Glad you enjoyed this one. This one really took me back in time! 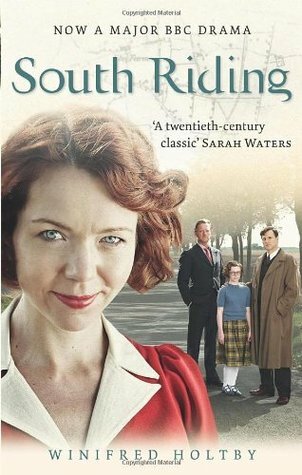 South Riding is one of those totally immersive books, with such rich detail and rounded characters that you almost feel like it’s history. And now you’ve made me want to read it again. I think it’s definitely a book to re-read! Oh, I love this book. I love Winifred Holtby but for me this was her best novel. I was fascinated by those 1930s local politics. This is the only book of hers I’ve read. I’m keen to read more! I tried to read this book many years ago and abandoned it as tedious. Just goes to show that there is a time and place to encounter every book – and frequently a level of maturity required before one can truly appreciate some of them. Despite having given up on it, it never dropped off my radar and I’ve been wanting to try it again for some time. I have a feeling I will love it second time around! Sandra, I do agree -sometimes it’s just the wrong book at the wrong time. And I think it’s the contrast and similarities between the 30s and today that made it so interesting to me (and I used to work in local government). Glad you enjoyed it–I want to reread and rewatch! Thanks for the explanation of the Ridings–I didn’t know that South Riding was fictional. I agree, the characters were so real and well-rounded, flawed and sympathetic. Such a shame Holtby died at such a young age. Are there ridings in all of England, or just Yorkshire? I started watching the tv version and didn’t care for it. I probably didn’t give it long enough. You’ve made the book sound wonderful, and I will definitely try and read it. Thanks so much. I found in on the kindle for only $2.99 so bought it!